I was recommended to see Paradise Now by a friend of mine who said, it was one of the most inspiring films he had seen recently. Although I respect his opinion as a media critic, I was not too sure I wanted to see a film on the never-ending Palestinian plight. Having completed my studies a couple of months ago, I have had to do a good number of papers analysing the Middle East conflict for my graduate courses. The Palestinian-Israeli stalemate was one of those "topical" issues that was dissected over and over until I got fed up because there seems to be no permanent solution to this particular conflict only "breaking news" of attack and counter attack that we have become familiar with over the years. Yet, I decided to see the movie after listening to Hany Abu-Assad's, (the Director of Paradise Now) Golden Globe award speech for best foreign language film. It was a simple yet moving speech, hardly surprising since the subject of the film is very close to his heart. The background of Paradise Now deals with the Palestinian struggle for independence from Israeli occupation. However, it is not simply a predictable story about a land of disillusioned people desparately trying to survive against the relentless Israeli oppression, it also sends a powerful message of peace to the world leaders and concerned people all over the world. The story revolves around two Palestinian young men Sayeed (Kais Nashef) and Khaled (Ali Suliman), who have been chosen together to carry out a suicide bombing mission in Tel Aviv. The two men are best friends who work as mechanics at a shabby auto repair shop in Nablus on the West Bank. The men come to know that they are chosen as human bombs only one day before the all-important mission. Jamal, the man who selects them, is a member of an unnamed Palestinian resistance group. He tells them that it is going to be the biggest operation for the Palestinians in two years and hence, they have to be extra careful to ensure the success of the plan, which is to take as many Israeli lives as possible along with their own. To Sayeed and Khaled the news is an honour and they readily accept their fatal assignment with a sense of duty and pride. The film follows the lives of the two men as they prepare themselves to become martyrs. Of the two, Khaled is relatively more cheerful than Sayeed - that is, as cheerful as one can be in a degrading life under occupation. Khaled tries to maintain his sense of humour, on the other hand, Sayeed with his deadpan face is seen brooding most part of the film. The audience soon finds the reason behind Sayeed's morose attitude. Sayeed is the son of a collaborator; who grew up in a refugee camp after his father was executed when he was only ten years old. Sayeed's traumatic past made him grow up to be a withdrawn adult carrying a burden of guilt and shame. As the story evolves, it delves deep into emotions and exposes the cost of long-term conflicts on the survivors that inevitably, kills the human spirit and forces people to make harsh choices. Besides the main protagonists of the film Sayeed and Khaled, the two other important characters are Suha (Lubna Azabal) an attractive young woman, who returns to Nablus, her native land, after many years abroad and Jamal (Amer Hlehel), the man who recruits Sayeed and Khaled for the suicide mission. Suha is the daughter of a widely respected Palestinian martyr and was born in France and raised in Morocco. She meets Khaled at the auto shop where Sayeed repairs her car. Suha is attracted to Sayeed and in the conversations they have, she tries to make Sayeed comprehend that violence is not the answer to freedom for their people. In the film, she alone plays the role of the moderate voice, the voice of reason, advocating for finding peaceful alteratives to ending the bitter struggle. Although Suha's martyr father was a hero in the community, she hates violence and strongly believes that Palestnians need to find other means to overcome their misery. She tells Sayeed that she would prefer her father to be alive than having to be proud of him. The storyline is full of suspense from beginning to its thriller-like climactic and unexpected end. There is never a slow or dull moment in the one and a half hour film. The suicide mission entails a lengthy preparation for the two chosen emissaries of death. The men get a new look. With their hair cropped, beards shaved and fancy suits, they are dressed to look like they are going to a wedding party in Tel Aviv. There are many poignant scenes such as the shot in which, Khaled and Sayeed's "last speeches" are video-taped. There is a mechanical problem with the video camera and therefore, Khaled's martyr speech needs a few takes to be recorded. He holds a machine gun in his hand and reads out from a script that explains there is no other way of resistance and that death is preferable to a life of inferiority and suffering. In the middle of the shoot however, he loses concentration, digresses from his mission statement and leaves an emotional shopping tip for his mother. During the preparation for their martyrdom Khaled asks Jamal what happens after their mission has been undertaken. Jamal assures them that two angels would receive them. Jamal has known the two men since they were kids and has immense faith in them. Their families have no idea about their sons' missions as they are advised not to mention it to anyone. Both the men enjoy final meals in their homes. Sayeed keeps staring at his mom, his mom however, does not suspect anything unusual. Then comes the big moment when the two head off to Tel Aviv; just as they are about to cross the border, something unexpected happens and all hell breaks loose. Everything moves in a frantic pace and the audience will find themselves absorbing every detail and anxiously following Sayeed and Khaled's fate. In a video store in town, Suha and Sayeed learn that speeches of martyrs are popular selling items, but Suha was shocked to discover that the price of the video of a collaborator, right before his/her execution is the same, if not more than that of a martyr's speech. The film reiterates some critical questions and talks about the crisis in the form of intense conversations and heated arguments between Suha, Sayeed and Khaled. Khaled and Sayeed insist that Israel views partnership with and equality for the Palestinians under the same democratic system, as the suicide for the Jewish state. The men think that Suha is naive and has been away from their homeland too long to understand the gravity of their situation. "Our bodies are all we have left to fight with," passionately exclaims Khaled and continues, "under occupation we are already dead; if we can't live as equals, let us die as equals." Suha retorts, "but what happens to the ones that are left behind?" She feels that it is foolish to give the Israelis an excuse to attack them, since Palestinians do not have the military or financial strength to fight them. She makes Khaled angry when she exclaims that all the talk about paradise in the after life is in his head. Khaled furiously responds that he would rather live with the notion of paradise in his head than in the living hell. Suha has the last word in the argument by pointing out that suicide bombing is not about sacrifice, it is simply revenge. What makes Paradise Now different from other films and documentaries that deal with the subject of much-publicised conflicts is that it neither glorifes nor condemns martyrdom. The film provides an honest glimpse into the life of two chosen suicide bombers and attempts to understand what goes on in the mind of a person who is about to sacrifice his own life to win freedom for his people. The protagonists are depicted as very real people, grappling with a multitude of human emotions. They are not cold-blooded fanatics, rather ordinary people who believe that there is no other way out for them. It is their sense of duty that helps them overcome mixed feelings of anger, frustration, helplessness, doubts and confusion. The film has received rave reviews for brilliant cinematography, direction, acting and for an overall flawless production. 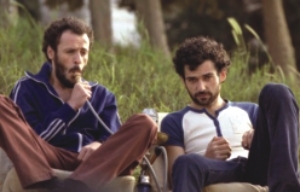 Hany Abu-Assad, the film's Israeli born Arab director took great risks in making this film. It was shot in Nablus, Nazareth and Tel Aviv amidst real terror threats and violence. Hany Abu-Assad in an interview said that they had to deal with all kinds of issues on a daily basis while shooting the film, including the kidnapping of the film's Palestinian location manager. The manager was later released thanks to the intervention from none other than the late Palestinian Prime Minister Yasser Arafat. There was also a land mine explosion that killed a few people in an area where the film crew finished their shoot just the night before. Palestinians were divided in their opinion - some factions thought the film was against suicide bombing and some thought it was pro-liberation. Considering the political turmoil in the region, it certainly took a lot of determination and courage on Hany Abu-Assad's part to undertake such a bold project. Interestingly, Paradise Now was made possible with the support from Palestinian, Dutch, German, French and Israeli production companies. 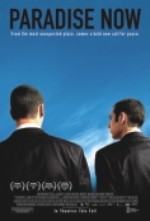 It was jointly written by Hany Abu-Assad and the film's Dutch producer Bero Beyer. It is not surprising that this brilliant film received many accolades including an Oscar nomination and the Golden Globe award. To be precise, it won a total of thirteen awards and seven nominations, such as, the European Film Award, Independent Spirit Award, National Board of Review award, The Amnesty International award to name a few. Given the recent grim situation in the Middle East with the ongoing fierce battle between Israeli army and Hezbollah that has led to many civilian casualties in Lebanon, Gaza and Israel, Paradise Now is a timely film that stresses on the futility of violence and calls for the permanent and peaceful solution to the Middle East crisis.